This article is about the musician. For his album, see Doc Watson (album). For the baseball player, see Doc Watson (baseball). In a 1989 radio interview with Terry Gross on the Fresh Air show on National Public Radio, Watson explains how he got his first guitar. His father told him that if he and his brother David chopped down all the small dead chestnut trees along the edge of their field, he could sell the wood to a tannery. Watson bought a $10 Stella guitar from Sears Roebuck with his earnings, while his brother bought a new suit. Later in that same interview, Watson explained that his first high-quality guitar was a Martin D-18. Watson's earliest influences were country roots musicians and groups such as the Carter Family and Jimmie Rodgers. The first song he learned to play on the guitar was "When Roses Bloom in Dixieland", first recorded by the Carter Family in 1930. Watson stated in an interview with American Songwriter that, "Jimmie Rodgers was the first man that I started to claim as my favorite." Watson proved to be a natural musical talent and within months was performing on local street corners playing songs from the Delmore Brothers, Louvin Brothers, and Monroe Brothers alongside his brother Linny. By the time Watson reached adulthood, he had become a proficient acoustic and electric guitar player. In 1953, Watson joined the Johnson City, Tennessee-based Jack Williams' country and western swing band on electric guitar. The band seldom had a fiddle player, but was often asked to play at square dances. Following the example of country guitarists Grady Martin and Hank Garland, Watson taught himself to play fiddle tunes on his Les Paul electric guitar. He later transferred the technique to acoustic guitar, and playing fiddle tunes became part of his signature sound. During his time with Jack Williams, Doc also supported his family as a piano tuner. In 1960, as the American folk music revival grew, Watson took the advice of folk musicologist Ralph Rinzler and began playing acoustic guitar and banjo exclusively. That move ignited Watson's career when he played on his first recording, Old Time Music at Clarence Ashley's. Also of pivotal importance for his career was his February 11, 1961 appearance at P.S. 41 in Greenwich Village. He subsequently began to tour as a solo performer and appeared at universities and clubs like the Ash Grove in Los Angeles. Watson would eventually get his big break and rave reviews for his performance at the renowned Newport Folk Festival in Newport, Rhode Island in 1963. Watson recorded his first solo album in 1964 and began performing with his son Merle, the same year. After the folk revival waned during the late 1960s, Watson's career was sustained by his performance of the Jimmy Driftwood song "Tennessee Stud" on the 1972 live album recording Will the Circle Be Unbroken. As popular as ever, Doc and Merle began playing as a trio with T. Michael Coleman on bass guitar in 1974. The trio toured the globe during the late seventies and early eighties, recording nearly fifteen albums between 1973 and 1985, and bringing Doc and Merle's unique blend of acoustic music to millions of new fans. In 1985, Merle died in a tractor accident on his family farm. Two years later Merle Fest was inaugurated in remembrance of his son. 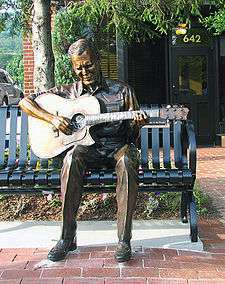 Doc Watson sculpture on the corner of King and Depot Streets in Boone, North Carolina. The plaque on the bench reads "Just one of the People". Arlen Roth writes, "...we can attribute an entirely new style and a whole generation of pickers to [Watson's] inspiration. He was the first rural acoustic player to truly 'amaze' urban audiences in the early 1960s with his dazzling, fast technique, and he has continued to be a driving, creative force on the acoustic music scene." Watson played guitar in both flatpicking and fingerpicking style, but is best known for his flatpick work. His guitar playing skills, combined with his authenticity as a mountain musician, made him a highly influential figure during the folk music revival. Watson pioneered a fast and flashy bluegrass lead guitar style including fiddle tunes and crosspicking techniques which were adopted and extended by Clarence White, Tony Rice and many others. Watson was also an accomplished banjo player and sometimes accompanied himself on harmonica as well. Known also for his distinctive and rich baritone voice, Watson over the years developed a vast repertoire of mountain ballads, which he learned via the oral tradition of his home area in Deep Gap, North Carolina. Watson played a Martin model D-18 guitar on his earliest recordings. In 1968, Watson began a relationship with Gallagher Guitars when he started playing their G-50 model. His first Gallagher, which Watson refers to as "Old Hoss", is on display at the Country Music Hall of Fame in Nashville, Tennessee. In 1974, Gallagher created a customized G-50 line to meet Watson's preferred specifications, which bears the Doc Watson name. In 1991, Gallagher customized a personal cutaway guitar for Watson that he played until his death and which he referred to as "Donald" in honor of Gallagher guitar's second generation proprietor and builder, Don Gallagher. For the last few years, Doc had been playing a Dana Bourgeois dreadnought given to him by Ricky Skaggs for his 80th birthday. In 1986, Watson received the North Carolina Award and in 1994 he received a North Carolina Folk Heritage Award. Also in 1994, Watson teamed up with musicians Randy Scruggs and Earl Scruggs to contribute the classic song "Keep on the Sunny Side" to the AIDS benefit album Red Hot + Country produced by the Red Hot Organization. In 2000, Watson was inducted into the International Bluegrass Music Hall of Honor in Owensboro, Kentucky. In 1997, Watson received the National Medal of Arts from U.S. president Bill Clinton. In 2010, he was awarded an honorary doctor of music degree from Berklee College of Music in Boston, Massachusetts. In his later life, Watson scaled back his touring schedule. Watson was generally joined onstage by his grandson (Merle's son) Richard, as well as longtime musical partners David Holt or Jack Lawrence. On one occasion, Watson was accompanied by Australian guitar player Tommy Emmanuel at a concert at the Bass Performance Hall in Fort Worth, Texas. Watson also performed, accompanied by Holt and Richard, at the Hardly Strictly Bluegrass festival in San Francisco in 2009, as he had done in several previous years. Watson hosted the annual MerleFest music festival held every April at Wilkes Community College in Wilkesboro, North Carolina. The festival features a vast array of acoustic style music focusing on the folk, bluegrass, blues and old-time music genres. It was named in honor of Merle Watson and is one of the most popular acoustic music festivals in the world, drawing over 70,000 music fans each year. Watson was inducted into the North Carolina Music Hall of Fame in 2010. In 1947, Doc married Rosa Lee Carlton, the daughter of popular fiddle player Gaither Carlton. Watson and Rosa Lee had two children – Eddy Merle (named after country music legends Eddy Arnold and Merle Travis) in 1949 and Nancy Ellen in 1951. On April 29, 2012, Watson performed with the Nashville Bluegrass Band on the Creekside Stage at MerleFest. It was an annual tradition for Watson to join the Nashville Bluegrass Band for a gospel set on the festival's Sunday morning. It would be his final performance. On May 21, 2012, Watson fell at his home, after which he was sent to Watauga Medical Center in nearby Boone, North Carolina. He was listed in critical condition but was responsive at Wake Forest Baptist Medical Center in Winston-Salem, North Carolina, after undergoing colon surgery. Watson was not seriously injured in the fall, but an underlying medical condition prompted the surgery which required him to be airlifted to Winston-Salem. Watson died on May 29, 2012 at Wake Forest Baptist Medical Center of complications following the surgery at the age of 89. He is buried in the Merle and Doc Watson Memorial Cemetery, Deep Gap, Watauga County, North Carolina, with his wife and son. In 2002, High Windy Audio released a multi-CD biographical album titled Legacy. The collection features audio interviews with Watson interspersed with music, as well as a complete recording of a live performance at the Diana Wortham Theatre in Asheville, North Carolina. The collection won the 2002 Grammy Award for Best Traditional Folk Album. In 2010, Blooming Twig Books published a comprehensive biography of Doc Watson, written by Kent Gustavson. The book, titled Blind But Now I See: The Biography of Music Legend Doc Watson, features never before published content regarding Watson's life and career, gleaned from interviews with Watson's friends and collaborators, including Norman Blake, Sam Bush, members of the Seeger family, Michelle Shocked and many others. The book also goes into detail on the life, supporting role and ultimate death of Merle Watson. An updated edition was released by Sumach-Red Books in March 2012. In April 2013, Open Records released a multi-disc collection of unreleased recordings by Doc Watson. The collection, titled Milestones, features 94 songs as well as stories, remembrances, and over 500 photographs. The collection was created by Watson's daughter Nancy and is being produced by ETSU Bluegrass and ETSU professor Roy Andrade. ↑ "Guitarist Arthel 'Doc' Watson". NPR.org. Retrieved 2016-05-16. ↑ "Doc's Guitar - The Guitar of Doc Watson". www.docsguitar.com. Retrieved 2016-05-16. 1 2 Miller, Dan (September 1998). "Doc Watson: Flatpicking Legend". flatpick.com. Flatpicking Guitar Magazine, Vol 2, No 6. Retrieved 2008-11-28. ↑ "Doc Watson Biography". Wilkes Community College. 2005. Archived from the original on February 12, 2009. Retrieved 2009-03-09. ↑ Menconi, David (March 2, 2003). "Doc of Ages". The News & Observer. Retrieved 2009-03-09. ↑ Doc Watson (2002). Legacy (CD). High Windy Audio. 1 2 3 Kaufman, Steve (1999). The Legacy of Doc Watson. Mel Bay Publications. p. 152. ISBN 978-0-7866-3393-7. ↑ "Doc Watson". Npr.org. Retrieved 2010-09-03. ↑ "Fretbase, Doc Watson's first Martin Guitar". Fretbase.com. September 9, 2010. Retrieved 2012-05-28. ↑ "R.I.P. Doc Watson; Read Our 2012 Interview". American Songwriter. Retrieved May 30, 2012. ↑ "Doc Watson". misterguitar.com/bios. Chet Atkins: Mister Guitar – Books & Bios. Retrieved 2008-11-28. 1 2 Havighurst, Craig (June 2003). "Living Legacy". Acoustic Guitar magazine. Retrieved November 20, 2009. ↑ Grimes, William (May 29, 2012). "Doc Watson, Blind Guitar Wizard Who Influenced Generations, Dies at 89". New York Times. Retrieved May 30, 2012. ↑ "INTERVIEW- Doc's orders: No heavy metal at MerleFest". www.readthehook.com. Retrieved 2016-05-16. ↑ Roth, Arlen (1985). Arlen Roth's complete acoustic guitar. Schirmer Books. p. 47. ISBN 0-02-872150-0. ↑ Callow, John (January 1997). "Gallagher Guitars". flatpick.com. Flatpicking Guitar Magazine, Vol 1, No 2. Retrieved 2008-11-28. ↑ "National Medal of Arts | NEA". Nea.gov. Retrieved 2014-07-12. ↑ Hayes, Rob. "Doc Watson Receives Honorary Doctorate". Retrieved May 30, 2012. ↑ Mansfield, Brian (May 30, 2012). "Doc Watson, folk music legend, dies at 89". USA Today. Retrieved May 30, 2012. ↑ "Folk musician Doc Watson responsive after surgery in N.C.". USA Today. Associated Press. May 26, 2012. Retrieved May 26, 2012. ↑ "Doc Watson Dead at 89". GoBlueRidge.net – High Country News, Weather and Bulletins. High County Adventures. May 29, 2012. Retrieved May 29, 2012. 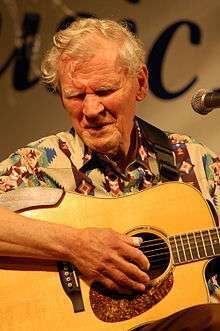 ↑ "Doc Watson Bluegrass Legend Dies at 89 in Winston-Salem". WFMY News 2. May 29, 2012. Retrieved May 30, 2012. ↑ Benjy Eisen (May 29, 2012). "Folk Pioneer Doc Watson Dead at 89 | Music News". Rolling Stone. Retrieved 2014-07-12. ↑ "Arthel Lane "Doc" Watson (1923–2012) – Find A Grave Memorial". Findagrave.com. Retrieved 2014-07-12. ↑ Smith, Jim. "Legacy". AllMusic. Retrieved February 25, 2013. ↑ "2002 – 45th Annual Grammy Awards". Past Winners Search. Grammy Awards. Retrieved February 25, 2013. ↑ "24-February-2013 Kent Gustavson interview on Outsight Radio Hours". Archive.org. Retrieved March 24, 2013. ↑ Mateer, Chris (September 12, 2012). "Interview: Author Dr. Kent Gustavson Discusses His Doc Watson Biography "Blind But Now I See"". No Depression. Retrieved February 17, 2013. ↑ Gustavson, Kent (2012). Blind But Now I See: The Biography of Music Legend Doc Watson. New York City: Blooming Twig Books. ISBN 978-1-937753-00-9. ↑ Gustavson, Kent (2010). Blind But Now I See: The Biography of Music Legend Doc Watson. New York City: Blooming Twig Books. ISBN 978-1-933918-87-7. ↑ Bunch, Wes (February 22, 2013). "Doc Watson's daughter, ETSU professor create box set of legendary guitar player". Kingsport Times-News. Retrieved February 25, 2013. Wikimedia Commons has media related to Doc Watson.